A comfortable majority of Canadians hold in their personal opinions that we need to keep the memory of the Holocaust alive. Overall, Canadians most often think that Jewish people in Canada have the right amount of influence in Canada, but nearly one in six Canadians express views that could be anti-Semitic. 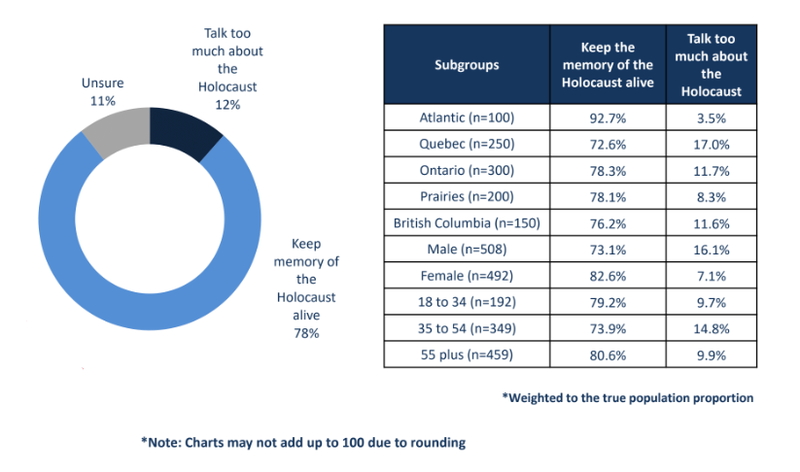 Nearly eight in ten Canadians believe that we need to keep the memory of the Holocaust alive, but over one in ten believe that Jewish people talk too much abut the Holocaust – When asked what statement best reflects their personal opinion, nearly eight in ten Canadians believe that we need to keep the memory of the Holocaust alive (78%), while just over one in ten believe that Jewish people talk too much about the Holocaust (12%). Eleven per cent are unsure. Canadians most often believe that Jewish people in Canada hold the right amount of influence in the business world, but nearly one in six say they hold too much influence – When asked what level of influence Jewish people in Canada hold in the business world, nearly half of Canadians say the right amount of influence (47%), fifteen per cent say too much influence and three per cent say too little influence. Thirty-five per cent are unsure. Canadians most often believe that Jewish people in Canada hold the right amount of influence in international finance markets, but more than one in ten believe they hold too much influence – When asked what level of influence Jewish people in Canada hold in international financial markets, over four in ten Canadians say the right amount of influence (44%), more than one in ten say too much influence (15%) and three per cent of Canadians say too little influence (3%). Thirty-nine per cent are unsure. Canadians most often believe that Jewish people hold the right amount of influence in the Canadian government, but over one in ten believe they hold too much influence – When asked what level of influence Jewish people in Canada hold in the Canadian government, over four in ten Canadians say the right amount of influence (43%), one in ten say too much influence (13%) and six per cent say too little influence. Thirty-eight per cent of respondents are unsure. Canadians most often believe that Jewish people hold the right amount of influence in the global media, but nearly one in six believe they hold too much influence – When asked what level of influence Jewish people in Canada hold in the global media, two in five Canadians say that they hold the right amount of influence (42%), 15 per cent say too much influence and five per cent say too little influence. Thirty-eight per cent of respondents are unsure. 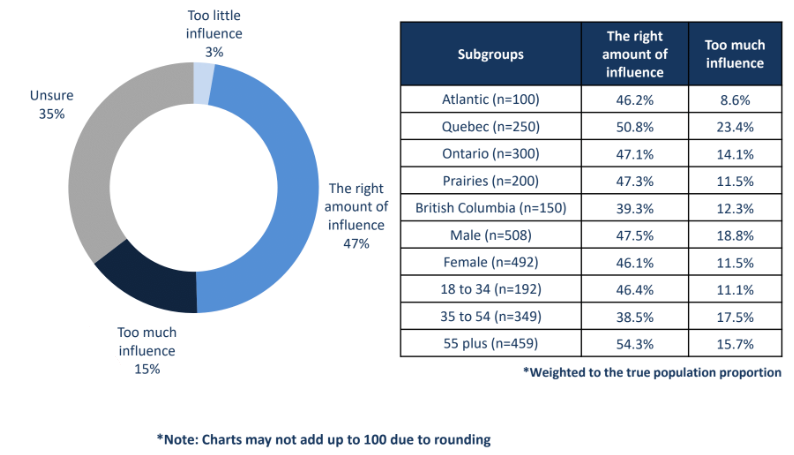 Canadians most often believe that Jewish people have the right amount of influence in global affairs, but nearly two in ten believe they hold too much influence – When asked what level of influence Jewish people in Canada hold in global affairs, two in five Canadians say that they hold the right amount of influence (41%), nearly two in ten say too much influence (18%) and six per cent say too little influence. Thirty-six per cent of respondents are unsure. These observations are based on a hybrid telephone and online random survey of 1,000 Canadians, 18 years of age or older, conducted between July 30thand August 5th, 2018 as part of an omnibus survey. The margin of error for a random survey of 1,000 Canadians is ±3.1 per centage points, 19 times out of 20. This study was commissioned by the Simon Wiesenthal Center and the research was conducted by Nanos Research. QUESTION – Some people say that Jews talk too much about the Holocaust, others say we need to keep the memory of the Holocaust alive. Which of these two views, if either, best reflects your personal opinion? Finding 2. Overall, Canadians most often think that Jewish people in Canada have the right amount of influence in Canada, but nearly one in six Canadians express views that could be anti-Semitic. Finding 3. 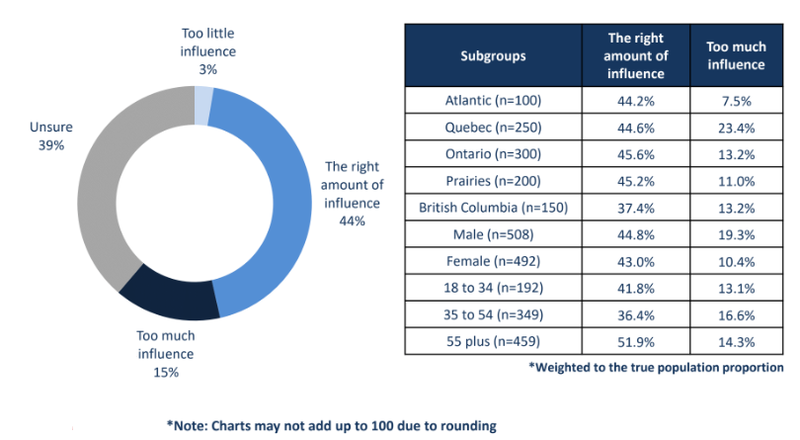 Canadians most often believe that Jewish people in Canada hold the right amount of influence in the business world, but nearly one in six say they hold too much influence. Finding 4. 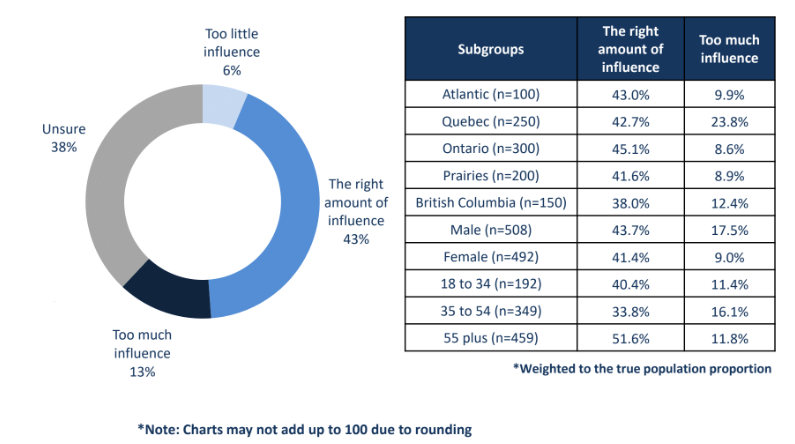 Canadians most often believe that Jewish people in Canada hold the right amount of influence in international finance markets, but more than one in ten believe they hold too much influence. Finding 5. Canadians most often believe that Jewish people hold the right amount of influence in the Canadian government, but over one in ten believe they hold too much influence. Finding 6. 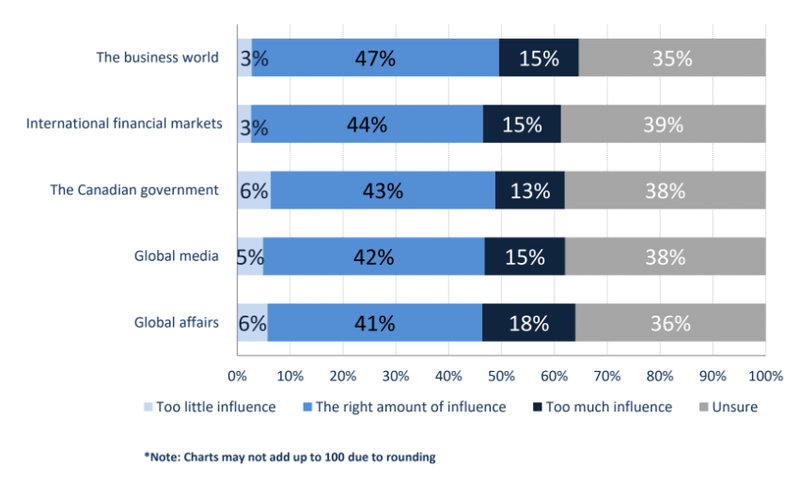 Canadians most often believe that Jewish people hold the right amount of influence in the global media, but nearly one in six believe they hold too much influence. Finding 7. Canadians most often believe that Jewish people have the right amount of influence in global affairs, but nearly two in ten believe they hold too much influence. Nanos conducted an RDD dual frame (land-and cell-lines) hybrid telephone and online random survey of 1,000 Canadians, 18 years of age or older,between July 30thto August 5th, 2018 as part of an omnibus survey. Participants were randomly recruited by telephone using live agents and administered a survey online. The results were statistically checked and weighted by age and gender using the latest Census information and the sample is geographically stratified to be representative of Canada. The margin of error for a random survey of 1,000 Canadians is ±3.1 per centage points, 19 times out of 20. The research was commissioned by the Simon Wiesenthal Center and was conducted by Nanos Research. Note: Charts may not add up to 100 due to rounding. Nanos is one of North America’s most trusted research and strategy organizations. Our team of professionals is regularly called upon by senior executives to deliver superior intelligence and market advantage whether it be helping to chart a path forward, managing a reputation or brand risk or understanding the trends that drive success. Services range from traditional telephonesurveys, through to elite in-depth interviews, online research and focus groups. Nanos clients range from Fortune 500 companies through to leading advocacy groups interested in understanding and shaping the public landscape. Whether it is understanding your brand or reputation, customer needs and satisfaction, engaging employees or testing new ads or products, Nanos provides insight you can trust.